July | 2015 | Whats Happening? Benefit ride for the Children’s Organ Transplant Association, (COTA). Rain or shine. Registration is from 9:30 – 10:30. Kickstands up at 10:30. $25 for single rider and $30 with passenger. Lunch included with rider sign up. Also a cruise-In at 9. No entry fee, however, donations will be accepted. Lunch available for $5 a person. After the ride there will be live music by Josh Black, a Raffle, 50/50 draw with all proceeds from the ride to benefit COTA in honor of Zane Snider. 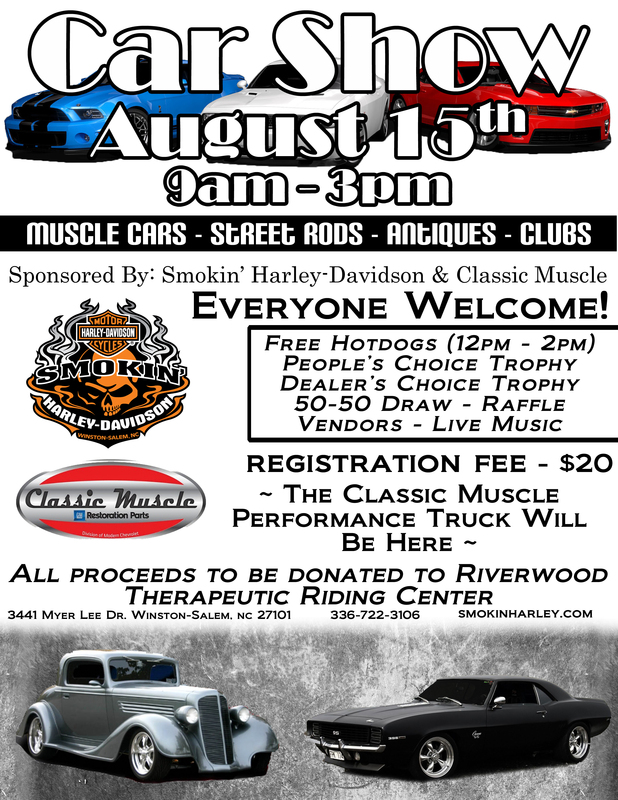 A “Benefit Ride”, will be held for COTA in honor of Zane Snider, a local child who is waiting for a heart transplant. 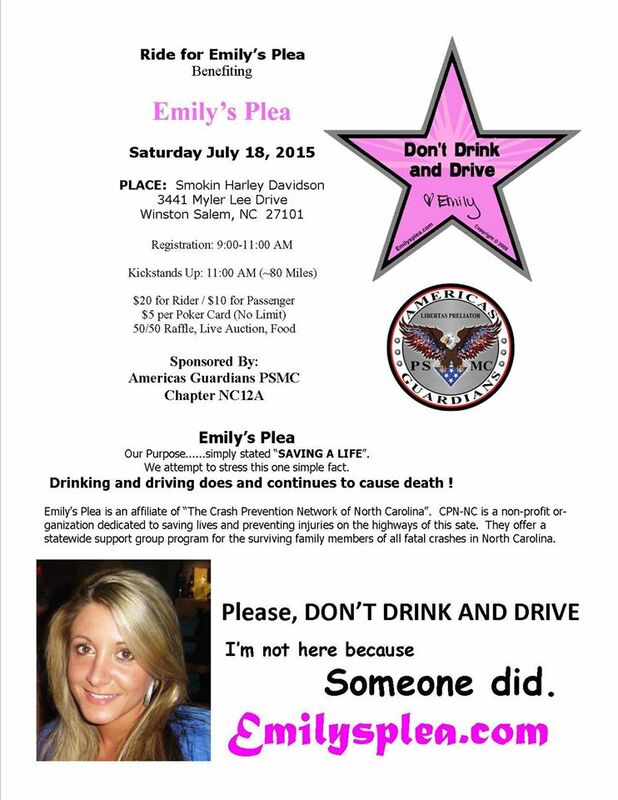 The event is planned for Saturday Aug. 1, beginning at Smokin Harley-Davidson, 3441 Myer Lee Drive in Winston-Salem. Nineteen-year-old Snider is listed for a heart transplant at Duke University Children’s Hospital in Durham, and has recently undergone a procedure to place a mechanical heart in him (the first of it’s kind for someone born with Snider’s condition) as he waits for the life-saving donation. Funds are being raised to assist with transplant-related expenses. Snider was born with Hypoplastic Left Heart Syndrome and is currently waiting for a life-saving heart transplant. The Snider family needs an estimated $100,000 to pay transplant-related expenses. Snider is affectionately called “Superman” by his family and friends due to his unquenchable spirit. For more information about the our Every Hero Needs a Heart Motorcycle Benefit Ride for COTA please contact Rhonda Mitchell at 336-978-1017. Snider’s family has asked for assistance from the Children’s Organ Transplant Association (COTA), a national charity based in Bloomington, Indiana. COTA is dedicated to organizing and guiding communities in raising funds for transplant-related expenses. COTA’s services are completely free of charge, and 100 percent of funds generated by COTA community fundraising campaigns are available for transplant-related expenses. Night of Destruction this Saturday at Bowman Gray Stadium! Night of Destruction this Saturday at Bowman Gray Stadium! July 18th @ 8:00 pm. Gates open at 6:00pm and the racing starts at 8:00pm. Bowman Gray Stadium offers concessions, but if you prefer, you may bring in your favorite snacks. Coolers are permitted, but we request the size be limited and NO GLASS or ALCOHOL will be allowed to be brought into the Stadium. Please no lawn chairs. Stadium seats are permitted. All seating is General Admission. We’ve been waiting for it and after this tweet, I guess we will have to wait some more. But hey, at least we know Blue Mountain Stateis done! 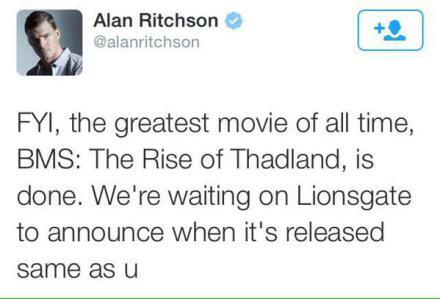 Now, who’s gonna make that call to Lionsgate? Under the Dome shoots at the sound stages today. Weather permitting, our Domies will be also heading to the Carolinian Motel on Market. We get a taste of what’s to come for the rest of the season as a few cast members and producers chimed in during their panel at the 2015 Comic Con. Episode 5 – “Alaska” airs this Thursday at 10pm EST on CBS. The Longest Ride Comes out on DVD today! It’s just like owning a lil piece of North Carolina, isn’t it? BUY IT NOW ON AMAZON! July 4th may have passed but can you really properly celebrate the independence of America without a good old fashioned hot dog? Celebrating with some of these Triad sensations. Chili included. I find it very hard task to try and say who has the best hot dogs in #winstonsalem. I mean I like them all the way than any other way. #ATW to me is hotdog on regular toasted hotdog bun, regular size hotdog, mustard, slaw, chili, and onions. Last years winners in 2014 Best of Winston Salem Smitty’s Notes™☝Were Winner: Skippy’s, Runner Up: PB’s Hotdogs, Honorable Mention: Pulliam BBQ and Kermit’s. What is your favorite place to eat Hotdogs in WInston-Salem Area? One of my favorite Hotdogs is at Dairi-O. Read my review. Check it out on YELP! Invite your friends, neighbors and co workers to the Summit Movie Night sponsored by The Summit Church where we will be showing Star Wars. Use this fun evening as a way to spend time with your friends and introduce them to The Summit. Food Trucks and activities start at 6:30pm and movie starts at dusk (around 8:45pm). Come and enjoy the blockbuster film outside on the big screen! The Drama Center presents Stephen Sondheim’s Into the Woods as its annual Broadway Show for Greensboro’s summer musical. The show features well known fairy tale characters in this comic yet dark musical, as well as Sondheim’s memorable and haunting tunes. The show includes 33 talented local actors of all ages, and provides an entertaining time for everyone. Shows are from July 10 – 12 and then from July 16-19. Shows on Fridays and Saturdays will be at 7 PM. 2:00 PM matinees will run on Sunday 12th , Saturday 18th and Sunday the 19th . All shows will be performed at the Weaver Academy Theatre, 300 South Spring Street in downtown Greensboro. Take advantage of our special price of $5 per person for the 7PM show on Thursday, July 16! All other performances will be $12 for students and seniors and $15 for adults. Tickets may be purchased at http://www.thedramacenter.com, or by calling the box office at 336-335-6426. The City of Greensboro works in partnership with the community to build an increased quality of life for all residents by fostering an environment where inclusion, diversity, and trust are valued. As the seventh largest employer in Greensboro, the City has a dedicated professional staff of 2,700 employees, who maintain four core values of honesty, integrity, stewardship, and respect. The City of Greensboro is governed by a council-manager form of government where a mayor and eight council members act as the legislative body. We can’t wait to see you this Sunday! Music for a Sunday Evening in the Park Concert Series provides free concerts every sunday from June through August in local parks in Greensboro. Justin Leon is a well-respected Kansas City Comic who has truly made a name for himself. Justin has spent the last 11 years traveling across the country perfecting his stand-up comedy. Justin’s comedy translates both nationally and internationally allowing him to perform in the top comedy clubs throughout the U.S. and Canada. He has been fortunate enough to recently return from the Middle East where he co-headlined the Red, White, & A Little Bluer Tour; a tour dedicated to the U.S. armed forces in Iraq and Afghanistan. Justin is a co-star in the 2012 independent film, Rhino, which is now showing at film festivals all across the United States. Most recently, Justin was a semifinalist in the prestigious Seattle International Comedy. SPECIAL EVENTS – For Special Events, your tickets are your reservations and its first come first serve seating so be sure to get there early! RESERVING A TABLE – Call 336-608-2270. Please state how many people are in your group. Your reserved table will be held up to 5 min before show time. After that it will be turned over to the next patrons in line. Please be on time. DOOR TIMES & SHOW TIMES – show times are 9pm on Thursdays, 8pm & 10 pm on Friday & Saturday. Doors open @ 8:30 on Thursday. Doors open @ 7:00 on Friday and Saturday for the 8pm show. Doors open at 9:30 for the 10 pm show. The UNtold Story of Unknown. While singing his own hilariously politically incorrect songs, Unknown Hinson plays guitar in a style incendiary enough to have Satan himself reaching for the antiperspirant. But don’t dismiss him as a novelty act. He’s one hell of a talent and has the music to prove it! Looking somewhat like Dracula’s nasty little brother who spent some hard years drinking and working as a carnival barker for a second-rate freak show, Unknown Hinson translates that vibe to his style of country and western-tinged psychobilly. The band is now touring nationwide, wowing audiences with outrageous and campy, white-trash persona and freewheeling, sleazy tone. Hinson’s most recent CD release, “Live and Undead”, melds weepy twang, searing guitar riffs and lyrics that speak of love-gone-bad. Recorded at a sold-out show, an enthusiastic honky tonk crowd sings along with the King on every song. Raucous, theatrical and over-the-top, Unknown Hinson isn’t just for the trailer park set anymore! Unknown is gaining international notoriety in the 14-34 demographic as the voice of lead character “Early Cuyler” in the popular show from Cartoon Network – “Squidbillies”. The first four seasons were so well-received that an immediate green light was given to future seasons. Check website for dates and time slots. Unknown Hinson is an international winner in the Independent Music Awards for his alternative Country track “Torture Town” from the album “Target Practice”.